The HBAC Group, located in Western New York State, provides parts, repair, sales & restoration of old brass cash registers. We provide worldwide service on a variety of antique cash registers, primarily from the National Cash Register Company, but also Hallwood cash registers. What started with the purchase of one old cash register has turned the HBAC Group into the largest purveyor of antique cash registers in the world. We are the only full-time business devoted solely to antique cash registers. Our services consist of: cash register restoration; sales of common and rare registers (brass, nickel-plated, oxidized, “woodies”); sales of replacement cash register parts; cash register repair; and dispensing of information for this unique collectible. We also build display stands to proudly show your cash register or slot machine. If you’re looking for information on your cash register, we can help. Antique brass cash registers make a great addition to your home game room (gameroom), as these cash registers make a great place to store your loose change to run those jukeboxes, slot machines, and pinballs. Whether you already own an antique cash register or are looking to purchase one, our website should give you some general information on antique cash register ownership. 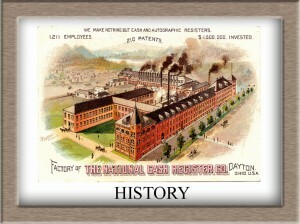 This information applies to National cash registers made between 1888 and 1915, when National made wooden and brass cash registers. After 1915, National switched to a cheaper sheet steel case, going from pretty and ornate to cheap and functional. Most of the registers made after 1915 that have the same mechanism as the brass registers were painted in a wood grain finish, making them appear to be made out of wood or mahogany. Bill Heuring, Sr, (commonly referred to “Old Bill”), started the business more than 20 years ago. It all started with one cash register. Bill was a district sales manager for an equipment corporation, and during his spare time on the road, would wander through antique shops. On one of his wanderings, he purchased an antique cash register. And while their beauty and ornateness were definitely interesting, the insides of the register intrigued Bill’s mechanical mind more. Soon he was purchasing more registers, and the availability of parts and information frustrated Bill. So, he started Hickory Bend Antiques and Collectibles, believing that he needed to do more than just cash registers. The business eventually evolved into purely antique cash registers. Now the HBAC Group is owned by his children, Barbara Hyman and Bill Heuring, Jr. Our business is solely devoted to antique cash registers. We provide parts, restoration, and sales of these beautiful antiques.